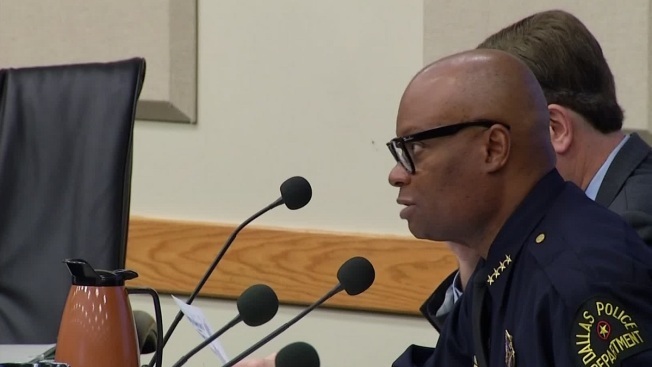 Dallas police leaders warned Monday that Chief David Brown’s new "Use of Force" training plan could actually reduce public safety. Brown and his top commanders spoke publicly about the plan Monday at a Dallas City Council Public Safety Committee meeting. It comes after more than two dozen officer-involved shootings the past two years, many of them fatal. “Our goal is to improve citizen and officer safety. We want to improve and continue to improve the public’s trust and confidence in the department,” Deputy Chief Albert Martinez said. The plan would increase use of deadly force training for every officer from every two years to every two months. “It’s sea change in training for our department and there are trade offs because when you’re training you’re not working on the streets of Dallas," Brown said. Leaders of the Dallas Police Association and Dallas Fraternal Order of Police both said they support additional training time but take issue with other parts of the plan. Sergeants will take over many training slots from regular officers and senior corporals with a goal of adding supervisor-level authority. “The people that are there are doing an excellent job. The problem is that they think they need to get in there with management to water it down,” said Richard Todd, president of the Dallas FOP. After a shooting in July 2012 that almost sparked a riot with angry neighbors in the Dixon Circle neighborhood, a policy change now forbids single officers from chasing suspected criminals alone on foot. Todd said that policy, and the training changes, have officers wondering what is allowed. “They’re going to be so worried about whether they’re going to get in trouble that they’re not going to react. They need to know about what levels of force they can use and when they should act,” Todd said. Another new Dallas program is adding body video recorders which some other police departments use the make a video record of what officers see. Dallas Police Association President Ron Pinkston said body cameras could help officers defend themselves from unjust accusations. “We want to make sure that the policy that regulates them isn’t a punitive policy and the privacy rights of the officers aren’t violated while they are driving along talking to each other during the day,” Pinkston said. “Our officers have to feel that this is a tool to protect them rather than some sort of gotcha,” Kingston said. The programs to improve public confidence in police officers actions come as Dallas police report very good crime fighting results. in 2013, for the 10th straight year overall crime went down in the City of Dallas. The city is now 6th among the top 10 US cities in crime rate instead of tenth where it was in 2003. “This is a wonderful achievement,” said Councilwoman Sandy Greyson said. Brown denied it is the result of underreporting real crime. “No big city has done it better than Dallas over the last decade. Dallas is best-in-class reducing crime more than any other big city in the country during this period,” Brown said. Council members challenge police to do even better. “Where we are celebrating today. I would like for us to knock it down, down and down,” said Councilman Dwaine Caraway. Sexual assault was the only crime category to rise by double digits in the 2013 numbers. It rose 12.96 percent. Brown warned that a sexual assault nurse examiner program expanding to more Dallas hospitals in 2014 could increase reporting of that crime. “We expect that victims will feel more comfortable reporting. As more victims report, more DNA will be put in the national databank of these perpetrators and more people will be brought to justice, whereas under reporting makes it more difficult to hold perpetrators responsible,” Brown said. Brown plans to implement the new use of force training plan by this fall.